Breastfeeding, Social Justice, and Equity, is the third book in a series that features work from the Breastfeeding and Feminism International Conference, edited by Paige Hall Smith, Miriam Labbok, and Brittany Chambers. The authors describe breastfeeding through the lens of race and ethnicity, socioeconomic status, and social ecology, and discuss how all those factors influence breastfeeding. Women's breastfeeding experiences are shaped by their race/ethnicity, socioeconomic status, and their social context. For the past 10 years, the Breastfeeding and Feminism International Conference has brought together a cross-disciplinary group of scholars, policymakers, and activists wanting to address equity issues in breastfeeding, and move the conversation forward. 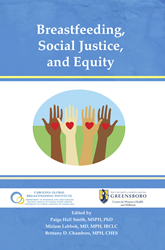 Breastfeeding, Social Justice, and Equity is the third book from a recent series of from this conference. The opening two chapters of Breastfeeding, Social Justice, and Equity provide an overview of changes in the past decade in U.S. and global policy. The next section focuses on the importance of centering women’s experiences in conversations about infant feeding, with a particular focus on the ways women’s experiences are shaped by race and ethnicity. Breastfeeding, Social Justice, and Equity is a highly readable volume that increases our understanding of the forces that influence breastfeeding, and outlines steps we can take to improve outcomes for both mothers and babies. Paige Hall Smith, MSPH, PhD, is professor of Public Health Education at the University of North Carolina at Greensboro (UNCG). In 2005, she was was named director of the Center for Women’s Health and Wellness at UNCG. As director of UNCG’s Center for Women’s Health and Wellness, Dr. Smith’s work focuses on developing an interdisciplinary and collaborative research and scholarship program on the health, wellness and quality of life of women, girls and the LGBTQI populations. Miriam Labbok, MD, MPH, IBCLC, was a professor and director of the Carolina Global Breastfeeding Institute, University of North Carolina, Chapel Hill. Since 1974, Dr. Labbok’s teaching, research, and service have addressed the needs of women and families to achieve optimal reproductive health, with the last 30 years centered on breastfeeding for the health of mothers and children. Dr. Labbok passed away in August 2016. This was her final book and is a legacy to her life’s work. Brittany Chambers, MPH, CHES, is a doctoral student at University of North Carolina, Greensboro in the public health education department. Her career objectives are to decrease reproductive and sexual health disparities experienced by marginalized women through development and implementation of structural interventions. Breastfeeding, Social Justice, and Equity is available at PraeclarusPress.com or on Amazon.com.